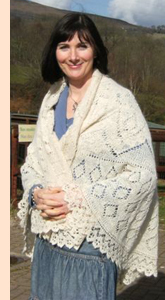 Mair Williams is a fellow guild member who is a talented spinner and knitter and has recently delved into the world of weaving. The photos of Mair have been taken at Greenmeadow Community Farm in Cwmbran. This is the home of the Gwent Spinners, Weavers, and Dyers guild that we belong to. The Gwent guild meets at Greenmeadow on Tuesdays from 1000 until 1400.